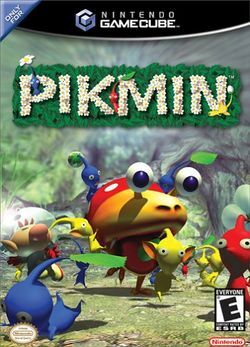 This is the first game in the Pikmin series. For other games in the series see the Pikmin category. Stranded on an unknown planet, Captain Olimar must enlist the help of these native Pikmin. Together, they must rebuild Olimar's spaceship and defend themselves from attackers. Time is tight. Cooperation is key. This innovative action-strategy game is unlike any other game you've ever played! Command masses of multi-colored Pikmin to accomplish tasks like defeating enemies, carrying valuable items, building bridges, bombing walls and more. Each type of Pikmin has a different ability. Red Pikmin can withstand fire, blue Pikmin can survive in water, while yellow Pikmin can fly higher and destroy obstacles by using bomb-rocks. Control the Pikmin sprouts individually, in groups, or in one large Pikmin posse of 100 creatures. The surreal world of Pikmin is brought to life by amazing graphics and incredibly detailed, often hilarious animation. Gameplay challenges include defeating enemies, solving puzzles and ultimately collecting all of the spaceship parts before Olimar's life-support system runs out. Captain Olimar has a limited number of days to explore the planet's wide range of environments. Each day is monitored by a constantly moving sun meter at the top of the screen. You have to make sure to complete your tasks and gather your stray Pikmin before the sun goes down, or they'll fall prey to the planet's nocturnal natural predators. To produce new Pikmin, you have to defeat enemies and carry them back to the Pikmin nests, called onions. If you want to make more blue Pikmin, command your blue Pikmin to carry defeated enemies and food back to blue onions. If you need red Pikmin, then make sure to assign red Pikmin to carry fallen prey back to home base. Once you get the hang of it, it's not difficult to keep a healthy stock of all types of Pikmin in reserve. You can have up to 100 Pikmin out at the same time, but you can store as many as you'd like in the onions. In addition to the different colors of Pikmin, each Pikmin can be grown into three different forms: leaves, buds and flowers. Pikmin begin their lives as leaves, but they mature into buds and flowers if you leave them in the ground after sprouting. Flower Pikmin are stronger and faster than bud and leaf Pikmin. This page was last edited on 23 October 2016, at 17:16. This page has been accessed 20,520 times.